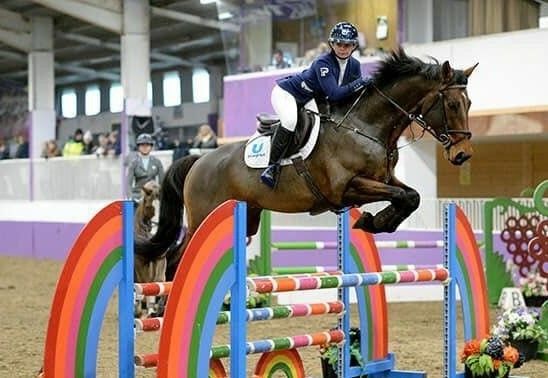 County Laois based showjumper and Bluegrass Horse Feeds customer, Vickie Anderson is our next “Behind the Success” rider in this series to give an insight into what it takes to be successful. We caught up with Vickie to give you a bit of background about her before she takes on the Q&A session. “I show jump in my spare time (I have a full time job in the family haulage business "A" Transport Ltd) and have been riding since the age of 4. I didn't get into showjumping until I was riding 13.2hh and that's where it all kicked off. I've had a lot of different horses over the years but I'm starting this year with 2 that I think a huge amount of. Last year we travelled to the UK for the first time and competed at the Hickstead Derby meeting. It was an unforgettable experience and I can't wait to get back there. I have competed up to 1.45 level and this year I hope to build on that. I firmly believe in minding your horse from the inside out. If they feel healthy and fresh and good in themselves, the rest will be an easier job. Between my job and my small team of horses I don't have much spare time but the time I do have, I do a bit of coaching. I am a BHS registered instructor and I love teaching, I love talking so that helps!! Do you need to ask??? ZACK!! I always have to get off and fix my saddle before I go in, whether it needs fixing or not!! I’m pretty good at online shopping!!! My first pony was called Minnie and the only thing she taught me was how to sit a buck!!!! My second pony was my real love, a 13h gelding called Willow Lord. He gave me the showjumping bug. Bounce grids (not with Zack, he’s intolerant of grids!!) and canter poles EVERYWHERE!! Start feeding Bluegrass now!!! And take all the advice you can get from all aspects of the sport. Someday you will need to use it. What seems like useless information today will be paramount another day.